This is a two-day (12 hours) professional course, which thoroughly covers the Android security model and concerns of both the developer and end-user point of view. This course is mapped for AND-802 exam. It’s highly recommended that the attendees of this course know the basics of Android application development knowledge.To acquire good knowledge of Android application development, trainees may attend the “Android Application Development” course provided by Android ATC (for more information about Android application development course click here). Build Android applications with security best practices in mind. Build more secure and more robust application that appeals to clients. 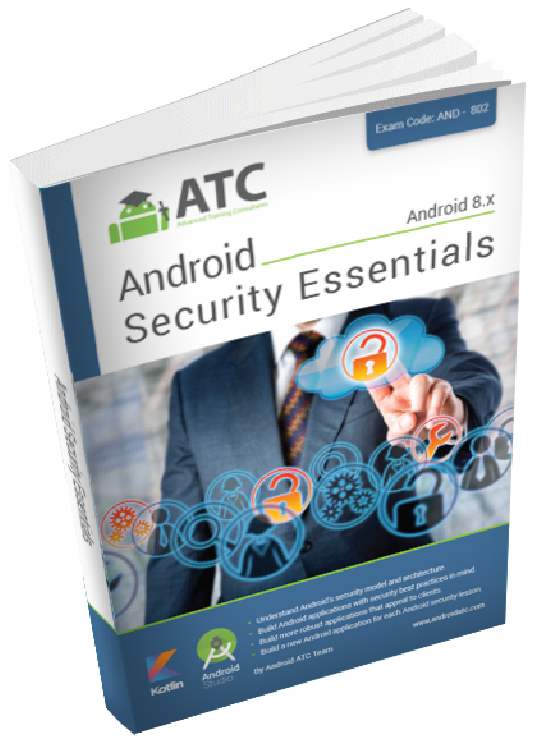 After completing this course, you will be ready for the “ Android Security Essentials ” exam version 8 (exam code: AND-802). This book can only be ordered in hard copy format. The total price of the book including shipping and handling is 59 USD (Delivered globally within 4 business days using express shipping). Click here to order now.